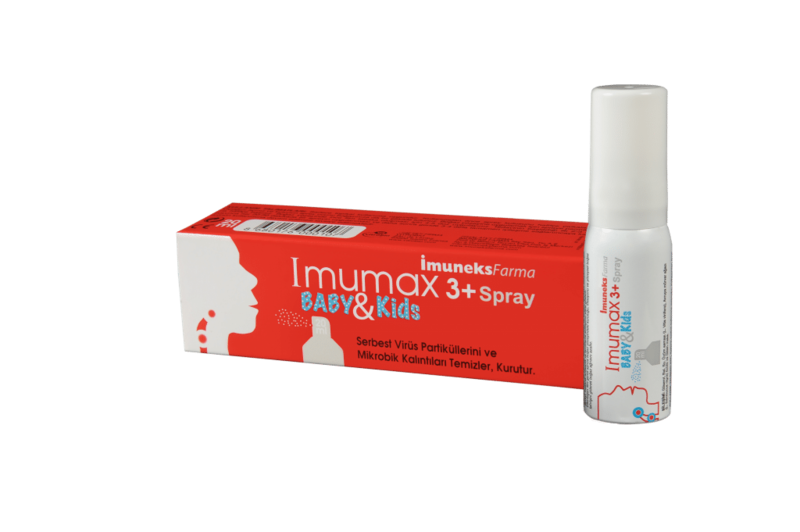 IMUMAX Baby&Kids Throat Spray, formulated from 100% natural and safe ingredients, is specially designed for the treatment of throat infections and sore throat in children from 3 to 16 years. For topical use only. Shake the spray container gently, remove the cap before use. Then direct the tip of the container’s opening to your throat vertically. Press the sprayer by applying finger pressure to release the product onto the upper part of the throat. Apply 4 to 5 sprays to form a thin product layer over the throat surface. It is recommended to use the spray every 20 to 30 minutes in the beginning of the treatment during the first 2 to 3 hours, and 3 to 4 times per day thereafter, up to complete recovery. 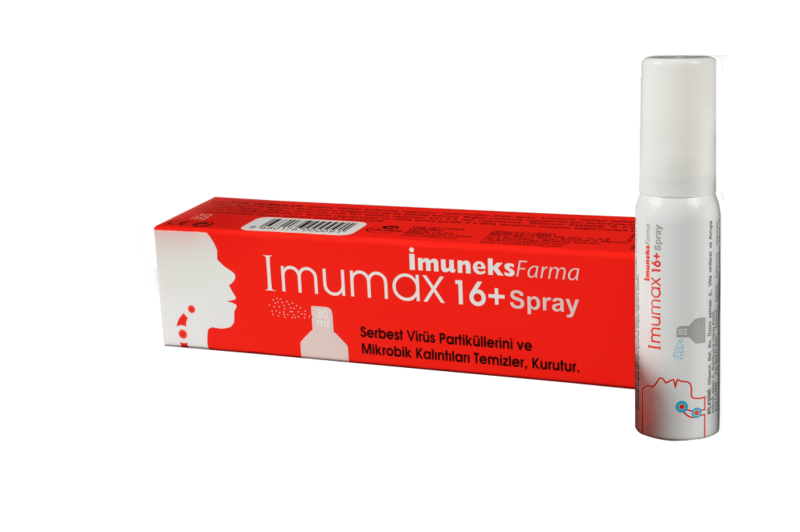 IMUMAX Throat Spray is used for the treatment of sore throat in adults over 16 years. Available only in pharmacies. IMUMAX Throat Spray is used for the treatment of sore throat. Available only in pharmacies. Shake the spray container gently, remove the cap before use. Then direct the tip of the container’s opening to your throat vertically. Press the sprayer by applying finger pressure to release the product onto the upper part of the throat. Apply 4 to 5 sprays to form a thin product layer over the throat surface. MODE OF ACTION: IMUMAX NASAL SPRAY acts as a decongestant, a viscous product containing a hypertonic solution, for the treatment of the symptoms of rhinitis, rhinosinusitis, and nasal congestion arising out of various causes. 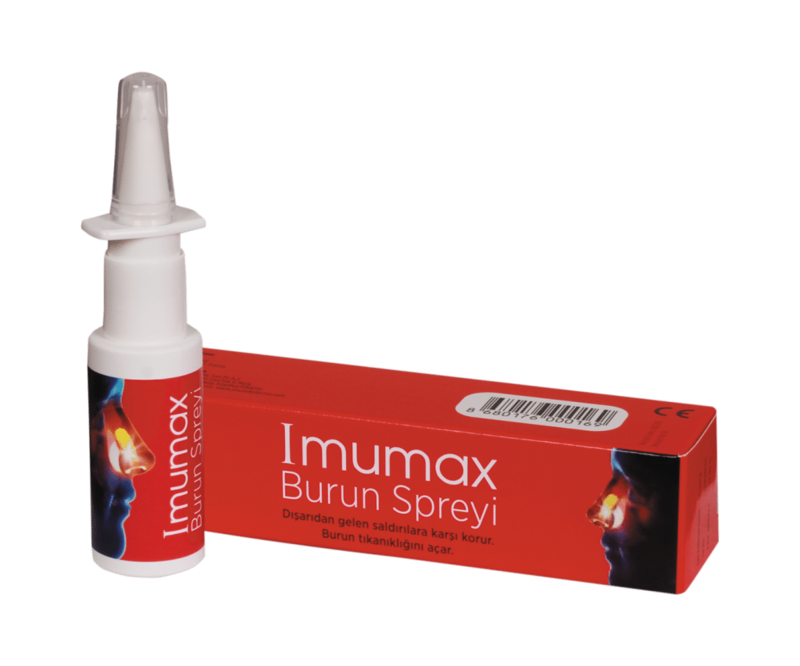 IMUMAX NASAL SPRAY forms a thin filmogenic layer on the nasal mucosa. Osmotically active filmogenic layer quickly draws hypotonic fluids from the deeper parts of the nasal mucosa and provides inside-out hypotonic fluid flow. This mechanical activity detaches all external contaminants present in the nasal cavity and removes from the nasal cavity, and therefore, eliminates nasal congestion. This strong osmotic activity also helps drainage of nasal sinuses to decrease intrasinusoidal pressure and pain. The filmogenic layer formed by IMUMAX NASAL SPRAY also protects the nasal surface against dryness, irritation, and external attacks from contaminants. Product formulation helps alleviate respiration within a short time. 1 – Thoroughly clean your nose before using the product. 2 – Gently shake the bottle. 3 – Remove the protective cap. 4 – Prime the pump by applying finger pressure once or twice until the product is transferred to the spray tip. 5 – Gently insert the spray tip into one of the nostrils and spray the product into your nostril by applying finger pressure on the sprayer. Apply the product by spraying 2 to 3 times into each nostril. Continue applying the product 2 to 3 times daily or more, if required, until full recovery is achieved. 6 – Tightly close the bottle cap after each use. 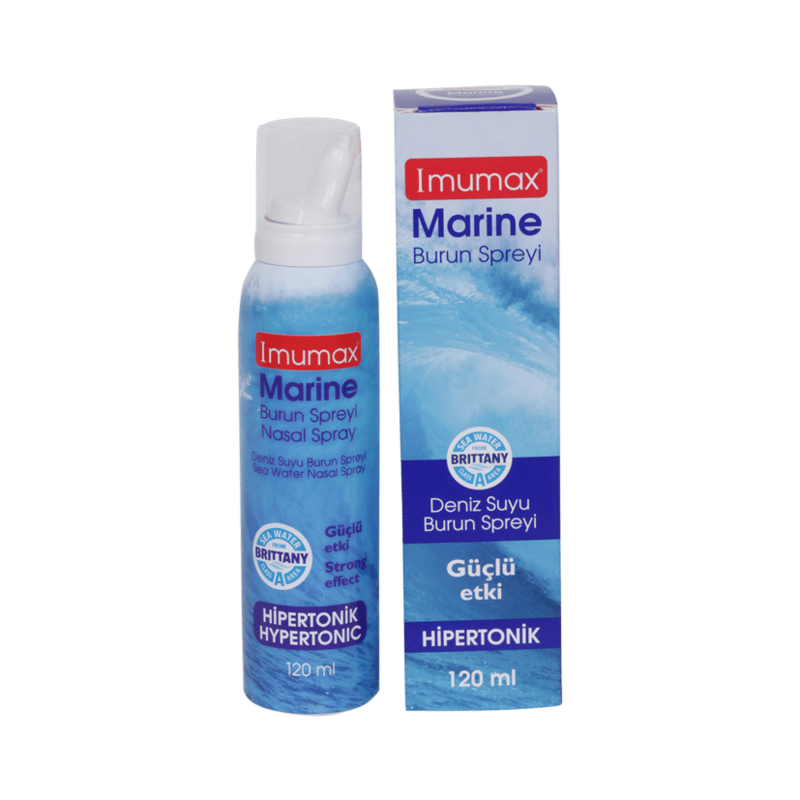 IMUMAX Marine Hypertonic Nasal Spray helps washing off and removing nasal discharge. Intended Use: Imumax Marine Hypertonic Nasal Spray is a medical device intended for use in children from 6 years and adults for nasopharnynx mucous membrane infections, nasal discharge, and paranasal sinus infections as well as snoring caused by dry mucous membrane. Hypertonic nasal spray clears excessive fluids in the mucous membrane cells based on the principle of osmotic activity. In addition to mechanical cleaning and elimination of congestion in the upper respiratory tract, this osmotic activity also helps reduce swelling in mucous membrane. Imumax Marine Hypertonic Nasal Spray may be used as a supplementary therapy provided that it is properly used in daily nasal hygiene in the following cases: nasopharyngitis; rhinitis and sinusitis causing nasal congestion; dry nose and hoarseness due to dry mucous membranes without nasal discharge, and as a supplementary therapy in otorhinolaryngology and pediatric patients. Vertically remove the protective cap. Place the spray tip on the bottle before the first use. Gently insert the spray tip into the entrance of the nostril. Apply finger pressure on the sprayer. Let the excess solution to discharge from your nose together with the mucus (nasal discharge) and then gently blow your nose. Repeat the same process steps for the other nostril. Wash the spray tip with water and dry. Apply to both nostrils as often as required. How does Excilor work? Excilor penetrates into nail and quickly reduces the pH value of the nail. Excilor creates an environment which prevents proliferation of fungi in the nails. Regrowth of the damaged nail requires time. Initial results of the treatment is visible following the regrowth of the nail. Excilor – Strike Out Nail Fungus! Efficient penetration into the hard nail plate surface is difficult. Many products in the market require filing of the nail before using the product. Only Excilor’s unique TransActive penetration technology™ provides in-depth penetration. Excilor is proven to efficiently penetrate into the nail without any requirement for filing the nail. Glycerol, Nail care oils and Biotin-enriched formula. 3-in-1 Protection against Plantar warts, Tinea pedis and Nail Fungus! InvisiBlock technology™ is the trademark defining the unique mode of action of Excilor® 3-in-1 Protective Spray. InvisiBlock technology™ forms an ultra thin, non-viscous layer acting as an “invisible sock”. 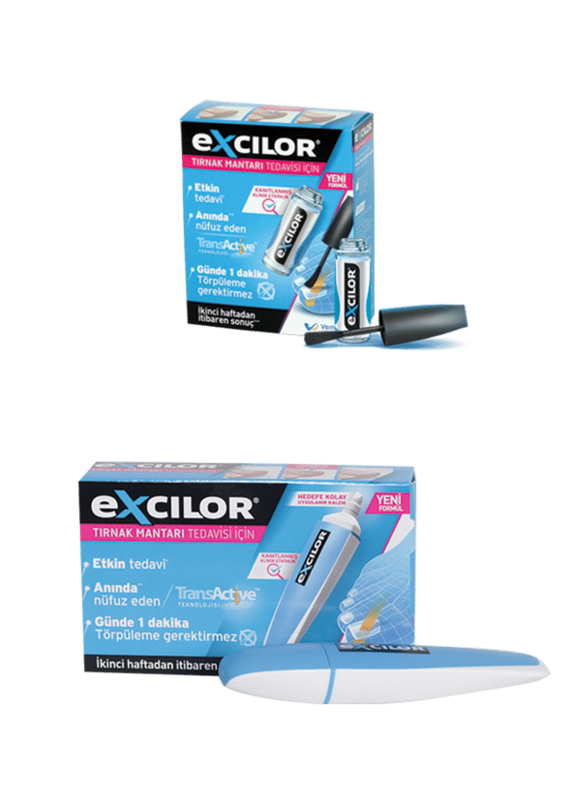 What is Excilor® 3-in-1 Protective Spray and what is it used for?Excilor® 3-in-1 Protective Spray is a medical device designed to provide protection against plantar warts, tinea pedis and nail fungus. Excilor® 3-in-1 Protective Spray instantly forms surface barrier with proven effect once it is sprayed on the feet and toes:• Prevents direct contact of microorganisms with skin and nails,• Environment created by the product prevents microbial proliferation,• Protects the skin minimum 8 hours. Active protection duration depends on the normal usage conditions. The product may be reapplied to ensure continuous protection in cases where the feet sweat more than usual, the temperature of feet is increased or the feet are left in closed, airtight environment for a long time. Excilor® 3-in-1 Protective Spray is invisible, oil-free, and leaves no stain on clothes. No washing is required, it moisturizes and cleans the skin, leaves a fresh scent thanks to its special formula. It is easy to remove using any skin cleaning product whenever required. Excilor® 3-in-1 Protective Spray efficiently prevents microbial proliferation due to its protective barrier, containing a special mixture, formed on the skin and nail plate surface. Leave in the product after application or clean with a desired skin cleaning product. Please contact a health care professional in case of any concerns.